When faced with the choice of adventure or inertia, you have two options. Hide away from life under a blanket of boredom, or stare the dare square in the face, gussied up in your very best adventure wear ready to tackle whatever comes your way. Tropical North Queensland is widely considered the adventure capital of Australia – not only are there countless creatures that have questionable interest in your life, but it appears the people who live here also like a good adrenaline rush. Jumping out of planes? Pfffft. We do it while reading the paper. Diving the Great Barrier Reef? That’s just any ol’ weekday. While both of these options are awesome, sometimes the adrenaline needs to be administered a little more thoughtfully (was it the beers at Hemingways that did you in? Or the snacks at the Mexican? We won’t judge you). 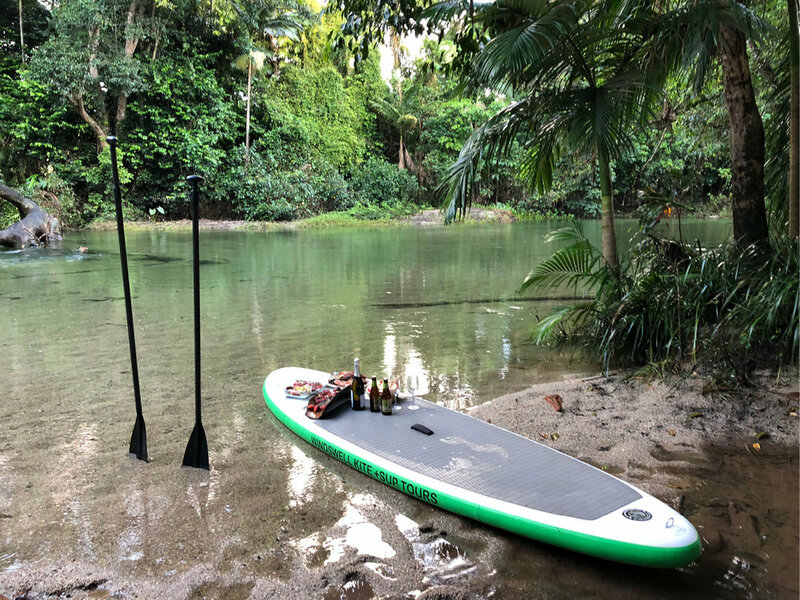 For something a little less heart-racy but still ab-busting, stand up paddle boarding (SUP, not to be confused with ‘suuuup…) is probably the exact level of adventure you’re looking for. In case you’ve been under an activity rock, SUP-ing is essentially the paddling of a large, specifically designed board with a single blade paddle from a standing position. The beauty of the sport is that you paddle and surf the board on your feet, making this a very versatile water sport. Windswell Port Douglas is the #boss when it comes to anything on a board in Port Douglas. Brett Wright (aka Bretto) was practically born on a surfboard. However, given the distinct lack of surfable surf on the tropical Queensland coastline, he quickly turned that into paddle boarding. Bretto and his team have the skills (and oodles of patience) in teaching and taking tours in and around the riverways and oceans of Port Douglas and Mossman. No experience? No worries! Windswell offer a range of lessons to suit all abilities and levels of adventure that’ll have you home on the board in no time. After that, the options of guided paddling tours will be calling your name. For the Rainforest River Paddle, the tour starts with an upstream paddle under the canopy of the Daintree Rainforest. Once you make it to the top, you’ll find a number of rope swings to push the adventure level up a smidge. On the way downstream, stop off to enjoy a natural body scrub in red ochre found on the banks of the Mossman. For those preferring a little reef over rainforest, the choice between Low Isles, Snapper Island or Undine Cay Adventure Tour is just for you. Join the team for a fast ride to one of three secluded spots for an epic day of guided paddling, snorkelling and spearfishing around coral cays while spotting turtles, rays, fish and the occasional (non-chompy) reef shark. Hell, now you’re practically a local.